This year’s Eurofilm Panorama, which ended on 29 November, gave special attention to films on revolutions. Some of the documentaries included: An African Odyssey, Cinema Komunisto, Letters from Iran, The Green Revolution, Grin Without A Cat, Another Country, Videogames of a Revolution and Tahrir 2011: The Good, The Bad and The Politician. Though this initiative could have been a good platform for debates on the political situation in Egypt, the lectures that followed the screening did not have a chance to offer in-depth discussions, despite some attempts. While documentaries were interesting, most stuck to the traditional documentary format; less narrative and more reliant on footage, interviews and hard information. The Green Wave and Tahrir 2011: The Good, The Bad and The Politician stood out, perhaps because of their cinematic approach. 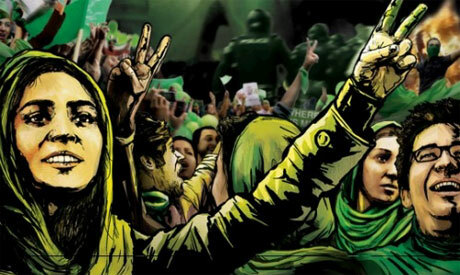 The Green Wave, which centres on the 2010 protests in Iran after the egregiously rigged presidential elections, smoothly alternates between live footage and animation. The film takes a melancholy and quiet tone, despite its politically-charged topic. This mood is enhanced by the very personal approach to the topic. The colourful animated parts accentuated the gloomy air, as well as the soft music. Many audience members commented that while they were watching the film their mind subconsciously wandered to Egypt's current events. Tahrir 2011 is structured in three chapters, as the title suggests. The second chapter - Ayten Amin’s on “The Bad” - looked at the 18 days that lead to the fall of the autocrat Mubarak through the eyes of the police, who were openly violent against protesters. She included interviews with four policemen, which reveals the cadets’ frustration with the situation. They even admit their extreme fear of the immense masses of people on that first Friday of Rage on 28 January, which was the first day the police were told to use force to disperse the millions-strong demonstration. One would think that seeing their fear and frustration would make the audience sympathise, but actually, people feel more enraged, especially when the audience sees footage that contradicts the cadets’ statements. Like The Green Wave, Amin’s part in the film took a highly quiet personal tone. The other two parts: The Good and The Politician, by Tamer Ezzat and Amr Salama, respectively, shed light on the revolutionaries and the concept of a dictator. In Ezzat’s part there are interesting moments, but as a whole it does not offer anything new or perceptive on those 18 days. Salama’s part, taking a satirical approach, was perhaps the least interesting. The comic nature was just a bit too superficial at times, but, the occasional burst of hearty laughter from the audience makes it undeniably hysterical. After a week of varied documentaries, the viewer starts to develop a keener eye for footage that is used intelligently. Grin Without a Cat, for instance, failed to engage because it simply compiled a lot of footage but gave it no clear direction. One of the more appreciable aspects of the film, however, was the general sense it offers the audience of the atmosphere of the worldwide revolutionary movements in the late sixties. Another quite interesting, yet not ultimately engaging film was the Serbian documentary Cinema Komunisto. The film showed the relation between cinema and politics in the era of the then Yugoslavian president, Josip Broz Tito. As a cinema lover, Tito highly influenced the cinema industry and it is evident in the vast array of different footage used in the film. “It was a big surprise for me that he had a hand in the making of cinema,” the filmmaker Mila Turajlic said. Some of the more comical footage to a modern-day audience was the propagandist material that pompously hails Tito’s greatness. One song insinuates that Tito thinks about the future about his country - even in his sleep. The level of Tito’s involvement in the cinema industry is one of the very interesting aspects of the film. In one instance he actually permits the crew to blow up a real bridge for the sake of a film. An unexpected focus of the film was on the projectionist. Yes, the one who runs the projector. The filmmaker Turajlic interviewed Tito’s personal projectionist, which is the only one that knew Tito’s opinions regarding the films they watched. Before the Pula Film Festival, which was the most important festival in the former Yugoslavia, Tito’s projectionist was an important man. He would be surrounded by people asking him what Tito enunciated regarding the films, and, accordingly, awards would be given out. The film is highly nostalgic of the old studios that are now, according the filmmaker, being obliterated and replaced by malls. She retells the history of the country through its cinema. A controversial character until this day, Tito was one of those people you had to either hate or love, explained the filmmaker. “Our generation, however, is lucky because it doesn’t have to be either pro or anti Tito. We can hold more objective views,” said Turajlic. The discussion that followed Cinema Komunisto was perhaps one of the most interesting lectures in the panorama, as it discussed the idea of the preservation of film reel and the hindrances the filmmaker faced when scavenging through archives to find this rare material. “If it weren’t for my film, some of this footage would have never been seen,” she stated. “We have to take a new look upon Yugoslav cinema,” she added; meaning that it needs to be preserved. The Egyptian film critic Rafik El-Sabban, who highly commended the film, lamented that there are no centres in Egypt to preserve archives. “I hope the new generation will be luckier and will preserve its archives,” he said.